The SLC C107, S-class W116 and W126 380SE. A 560SEC from Tilman's Gallery. The DB-company put this flagship of the Mercedes fleet on the gift table to the centenary of Benz' and Daimler's motor carriages. Different sources give different production figures of the 420SEC. "Who knows it accurately ?" was the question of our quiz when this site came out. Gerben van Vlimmeren from The Netherlands who is running the First unofficial W126 page posted that 3682 is the right figure. He found the data in "Mercedes-Benz Collector's Guide", Part IV, ed. by J. Taylor. Doug Sogolow from USA, long-time host of The 560SEC Group, insisted on the number 3680 which he protested was "misappropriated" from a "reliable" source. Martin Makolski from Germany presenting The Mercedes-Benz W126 Community cited Heribert Hofner's "Die S-Klasse von Mercedes-Benz" where 3689 is stated, and even found the number 3690 in Tim Cole's "MB Typenatlas". Statistics came out to be a puzzling thing. A nice second-hand 420SEC should be the First Prize of this quiz (see our seller's list below) but, unfortunately, some sponsor was not found ! Merely why ... ? Andreas Münger from Germany finally inquired of DC in Stuttgart. Their official answer: "Exactly 3680 420SECs were produced !" So this number is taken for true; and Doug's source was really "reliable". But where the other numbers came from remainded unclear ? There were only 3 prototypes of the 380SEC before its serial production had been started. Another interesting question was raised by Frederick Auld from "Guinness" (beer or book I don't know): "How many RHD (Right Hand Drive) versions of the 420SEC were produced ?" Wow ! This number could not be found up to now but Terry Hall from our registration list replied as the first member owning such a car. He also posted another interesting fact: RHDs (with the steering on the "correct" side, as he's convinced) have a different parking brake to the LHDs, namely a "pull on and twist to release" brake under the dashboard and no "foot operated" brake as in the "usual" LHDs. 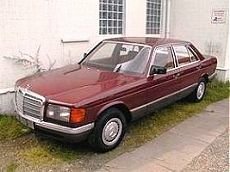 May be a steering in the middle of the car would have been the most gentle solution for the W126 which was exported to more than 100 countries. So the demand for the 380SEC dropped quickly when the 500SEC appeared on the market, and the figure of produced 500SECs dropped when the top model 560SEC became available. Lot of extras for the less powerful SECs was standard in a 560SEC pushing also the price to new records. Nevertheless, the figure of the 560SEC was held on a high and nearly constant level over the entire time of production. 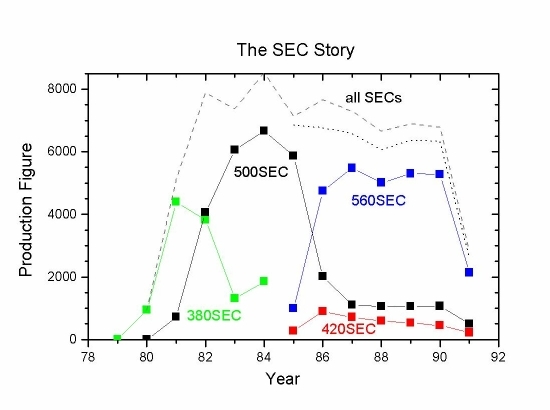 The dotted line in the graph of the SEC story shows the sum of 500SEC + 560SEC. It steadily holds on the maximum level of the 500SEC production in 1984 ! Who created such statistics is clear but why there was so less and, moreover, from year to year further dropping demand for a 420SEC ? In 1985 the catalytic converter became available for the W126. To compensate for the about 7% loss of power (10 km/h of max speed) due to the cat, the volume of the M116.963 engine of the 380SE/SEL/SEC was enlarged from 3818 ccm to 4196 ccm (M116.965). In this way the power of the cat version of the 420SEC could be held at 150 kW (204 PS) as the 380SEC formerly had. 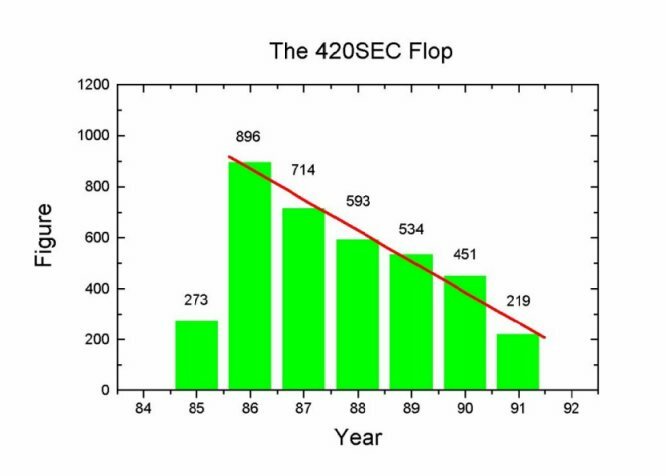 The 420SEC without cat achieved 160 kW (218 PS) comparable with the new cat version of the 500SEC (164 kW/223 PS). But the 405 Nm torgue at 3000 rpm of the M117.965 engine generated remarkable better dynamics than the 325 Nm at 4000 rpm of the M116.965. Taking into account that, due to these characteristics, the fuel consumtion of the 500 was in average only a little more than half a litre higher than that of a 420, and the basic price of a 500 was only about 5000 DM higher than that of a 420, the decision to bye a 500 instead of a 420 was obvious for a sporty driver who did not need the luxury of the 560SEC and would not pay another 15.000 DM for that. This trend did also not change with the 1987 upgrades when the 420 reached the 165 kW (224 PS) of the former 500, and the new cat version of the 500 achieved 185 kW (252 PS) and 390 Nm torgue at 3750 rpm. The development of the taxe for a car without cat was much more progressive than going with the volume of the engine. And surely nobody bought an SEC for more than 100.000 DM for a two years use. 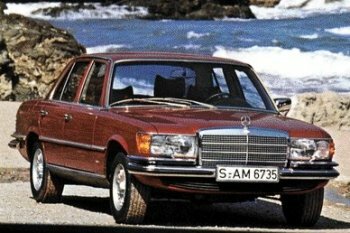 Only the above mentioned minority had to smile contentedly sitting in a Mercedes-Benz 420SEC, and they gladly would have done the same in a little less powerful but very cost-effective 380SEC. So the question about the necessity of a 420SEC is really obvious. The answer is given by the production figures of the 420SEC. Who doubts this argumentation can have a look on the production figures of the R107. 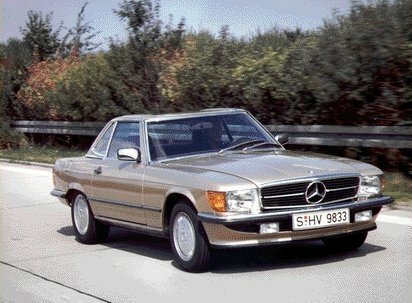 The 420SL is with a total production figure of 2147 the exotic among the R107 models and even more rare than the 420SEC. Hello 420SEC community, hello MB enthusiasts ! This site has already been visited by MB-fans from all continents. So let us start some communication ! Please, write some words into our guestbook. Your opinion, critics or comments are welcome. Thanks ! Hallo 420SEC-Gemeinde, hallo Freunde der Sternenmarke ! Hier ist Eure Meinung, Eure Kritik oder Euer Kommentar gefragt. Bitte schreibt ein paar Worte in unser Gästebuch ! Danke !